Hi, foodies. Welcome to Ayesha's kitchen. Dopiaza / Chicken do pyaza / murgh do pyaza is a delicious South Asian curry dish. Do pyasa means two onions. For this dish, onions are added at two stages during cooking. One while cooking and other for tempering. 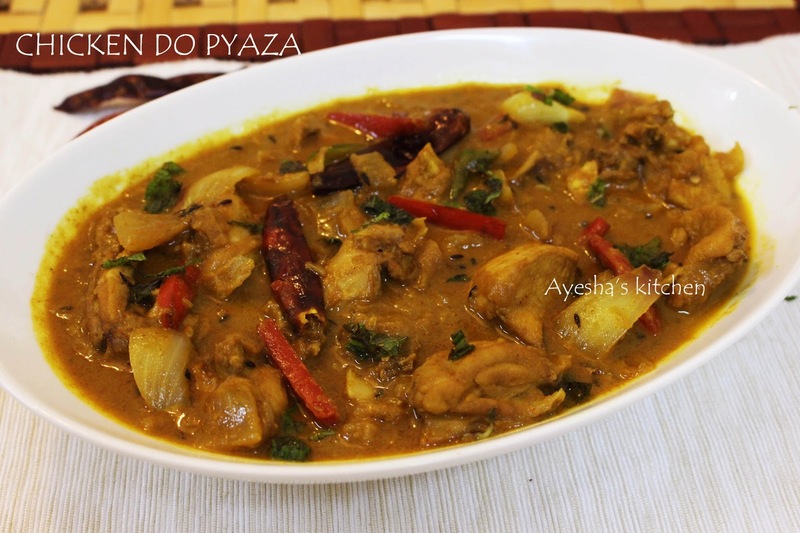 Hence this dish is named Chicken Do pyaza , '' chicken with two onion". This dish has become the staple dish of Hyderabadi cuisine (you can also check my Hyderabadi dum biryani recipe here ). Like any other Hyderabadi dish, the addition of sour agent is the key part of Dopiaza Curry. Raw mangoes are often used for this purpose however lemon juice and cranberries can be used as well. Healthy chicken recipes for dinner is the one searched for long. For me, preparation of dinner meal is a hard job. So always peep in google for some simple recipes. If you are thinking of what to make with chicken, then give this a try. 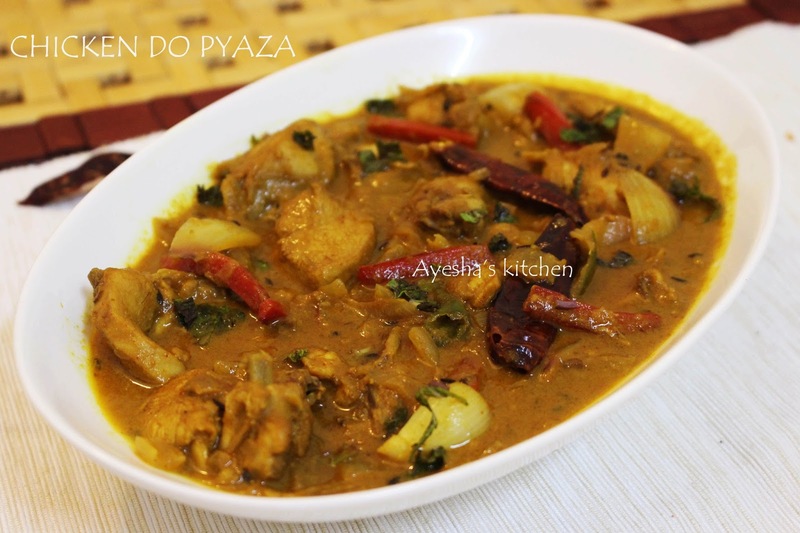 Chicken do pyaza is a healthy chicken recipe which pairs best with dosa, chapati or Indian bread. Recipe courtesy Vahrehvah com / vah re vah. Heat oil in a pan and add cumin seeds. Once it splutters, add finely sliced onion. Once the onion becomes golden, add ginger garlic paste. Cook until raw flavor is gone. Now mix together yogurt, chili powder, coriander powder, turmeric powder, cumin seed powder in a bowl. Add this to the onion mixture and cook for a minute. Add required salt too. To this, drop chicken along with green chilies and some water, Put the lid on and let it cook until chicken becomes tender. Heat oil in another pan and saute roughly chopped onion, dried red chilies, bell pepper slices. Pour this on the top of the chicken. Then add lime juice and coriander leaves. Mix well. Serve hot along with dosa, the Indian bread. Yummy and flavorful. For more video recipes, please check my youtube channel Ayeshas kitchen.